January 29, 2019 January 29, 2019 ~ Mike K.
Play if… Christmas songs are on your radio or playlist as soon as HALLOWEEN is over. Avoid if… you ever got coal for Christmas, which led to a deep loathing of the man in the red suit (Claus, not Satan). Description (from the company website): The Elves have gone on strike. They are tired of the long hours and low pay and have hopped a plane to Palm Beach before completing the final gifts for delivery. You have 45 minutes to complete the remaining toys and save Christmas. It is not that simple, though. These elves were particularly vindictive and have created a series of puzzles to prevent anyone from being able to finish what they started. It is up to you! Staging Area: EXIT Plan has a great reception area (two, actually) with lots of chairs. There is a large flight of stairs to reach the main lobby. Note: this escape room experience is not in their main location, but in a small office that is next to the main parking lot. Description of the room: You enter Santa’s workshop, complete with presents, Christmas tree, fireplace, and package wrapping area, along with a live “elf” sitting in a chair by the door. Understanding of the Mission: Find the components to the remaining presents and get them into Santa’s bag before Christmas is ruined. Our Suggested Party Size: This room is rated 2-8 people, and we had 4 experienced people, which should have been enough. The Escape Room Guys attempted to save Christmas, and failed to complete the last task. Damn those dastardly elves! We’ve known the people at Exit plan for over a year now and we’ve done almost all of the rooms, everything but the time travel one, so we’ve come to expect a level of difficulty as well as production value. When we heard that there was a Christmas pop-up room, we figured it would be in our best interest to see what they had to offer so off we went. This was a 45-minute room, not the usual 60, but still saddled with the normal set of of rules. I wasn’t sure that was going to make much of a difference, but as you’ll see below, it did. We’ve had great experiences in all the rooms we’ve done at Exit Plan, and when we heard that they had a holiday-themed room, we asked if we could come check it out. They booked us, and we were excited to do our first holiday room (lots of locations are beginning to do temporary rooms for the holidays, so expect to see this happening more and more). Unfortunately, we overthought the room and that led to our loss. It’s 11:15 p.m. on Christmas Eve and the elves have gone on strike (peace’d the f out). Every single gift has been made except for 3. All of the parts are there, scattered around the workshop. All you have to do is find them, box them up, and put them in Santa’s bag. Sounds stupid simple but we knew it wouldn’t be. Exit Plan is known (by me) to be deceptively tricky so, although I was looking for them, I still failed miserably at finding where everything was hidden. Rating: 8/10 After hundreds of years working for the Claus, the elves have decided to go on strike and head to sunnier pastures. The remaining elf, Buddy, is pleading with you to finish their work to complete the remaining toys and get them into Santa’s sack so he can leave on time and deliver toys to all the good boys and girls. This was a great original theme… a few of the other Christmas-themed rooms are focused on finding Santa’s list and getting your name moved from the Naughty to the Nice list, while this one required you to complete toys and getting them into Santa’s Bag of Holding (think of Herimone’s bag in Deathly Hallows). The live actor in the room was also a good touch and kept you on task as you were going through the experience. I also liked the story line and how much detail they gave you, both on the website, their video, and in the pre-room briefing. Find the missing pieces of the remaining toys, put them together properly in their respective boxes, and then the boxes into Santa’s sack (which looks conspicuously like a USPS mail bag; I knew he had help!). I was kind of surprised that there was a live actor in there but she wasn’t much of a distraction (‘cept when she was strumming the guitar…or was it a ukelele, I don’t remember). She did help us a little bit but inevitably it didn’t matter. No carols needed to be sung, no candy canes wrapped; only presents found. Could have thrown a twist on it and find the real identity of Santa? Who knows maybe next year. Rating: 7.5/10 You have to find a way to complete the remaining toys and get them into Santa’s bag before he has to leave to deliver them across the world. Time is of the essence since he has to deliver to 500,000,000 households. There is a good challenge here because there is actually quite a lot to do in only 45 minutes. We felt that we probably needed another minute or two to complete the last puzzle. It is pretty clear as to what you need to do (well, it becomes clear the more that you go through the room), and the mission is pretty unique, so this section also gets a pretty high score from me. I felt like I was running around a lot in this room, which I generally enjoy, but was basically surprised that I had to that much considering how small the space was. Rating: 9/10 The puzzles in this room all revolve around games or the holidays, and the games span generations (in that there are games that your grandparents or parents may have also played, but there are also a few that may not have been played by Generation Xers). The ways they are integrated, however, are pretty clever and use the actual game pieces to help provide the solutions (there is also a mini-scavenger hunt feeling to this room, which makes it perfect for kids). The puzzles ranged from game-playing to observational and there are times when you’ll be better off having two (or more) people searching for the answers or working on a specific piece. I really liked the one puzzle that used an older game (from when I was a young kid) and integrated that along with some other items in the room… puzzles that I’m normally pretty good at. I thought it was a clever way to deliver the information to us. Lots of locks in this room, but there were also a fair number of surprises that occur once you have the solution to certain items. And since many of them were built specifically for this room, lots of originality as well. And, yes, Jason… we did get candy canes upon leaving. I’ve said it once and I’ll say it again and again: Nothing was overly difficult in this room. But as Mike said, we quite disastrously overthought this room (and this has happened before but just not to this extent). It’s one thing to not know what the hell is going on in a room but it’s another thing to understand the puzzles and not be able to solve them. This is what pisses me off most and it’s not Exit Plan’s fault at all. We screwed the pooch on this one and we were definitely in the latter group. Considering we failed miserably, I’m not going to give a difficulty range, as it will be skewed I think. Rating: 6.5/10 So, I’ll flat out say that we HORRIBLY overthought this room. This room is their easiest and made for families with kids and you had 4 people all over 25 who failed it. We failed because we didn’t check each other and didn’t follow Rule #3 (we lost a lot of time on missing certain elements from puzzles that we solved that we needed for later). That being said, we did move pretty quickly through the room until we hit that main stumbling block. I’m going to call it a generational thing because I had never seen something like that before, and struggled with it until we got the hint. Nothing in the room was overly complex… you just needed to maybe look at it through the lens of a child (hey, it’s Christmas, right?). They had a nice mix of complexities where you could solve things just by looking at them and going up to really having to focus and pay attention to what you were doing. The game quite quickly pointed us all over the room and then back to a central location to complete the build/packaging of the final 3 toys. There was a little more Christmas-morning-living-room feel than workshop here, but it didn’t really matter because you didn’t have time to make that assessment during the game (maybe if we had that extra 15 minutes…). I’ve never done a pop-up, holiday themed room before, and I’m not the biggest fan of Christmas-themed anything (other than Die Hard, which Bruce Willis said is not a f&^*ing Christmas movie), but the game was fun and as we always say, you only get out what you put in. Rating: 9/10 The room was extremely well decorated, and it reminded me of the settings that malls try and create for kids at the holidays when they can go and sit on Santa’s lap (this is a total compliment… I’m talking about the ones that have houses and thrones and trees and trains and packages and fake snow and elves… not the ones that just have a big chair and a poorly-dressed Santa). It gave a very Christmas-sy feeling and was a nice way to spend some time in the middle of December. The room flowed really well and it had things for people to look for and solve independently before going linear to its ultimate final puzzles. There was plenty for us to work on. The puzzles and their locks all focused on the theme (Santa or the holidays or toys) and they lent themselves to the experience, and as I mentioned before… some of the items were built specifically for this room so they were fully unique from what we’ve seen before. I had an ok time playing through this room. I say ‘ok’ mainly because we were all getting annoyed with each other due to the communication problems and just lack of coherent thoughts among the group. I had a lot of fun going through this room. I don’t like to lose, so not completing the room in the allotted time period was disappointing, especially for it being my 100th room. She was good, stayed out of her way (literally, she didn’t move from her rocking chair), so no complaints. Our GM was good. She was instructed as to who we were and didn’t give clues until we asked. Being in the room, she played her role of Buddy the elf very well. We asked for some help and felt appropriately stupid after. Also, what Mike said. She was told who we were and not to nudge us as she might other groups. We asked for our 3 clues, and we did have to ask for clarification as to some of them, or a bit more to actually understand what she was trying to help us with, but I’m chalking that up to us getting frustrated at the end too with the time expiring. Final Thought: There’s not much more to say here. This is a good room and was a fun activity for the family. We just overthought it and had problems with one of the puzzles. Overall, a great experience and definitely check it out if you can get to it before it closes down, or if they bring it back for Christmas 2019. 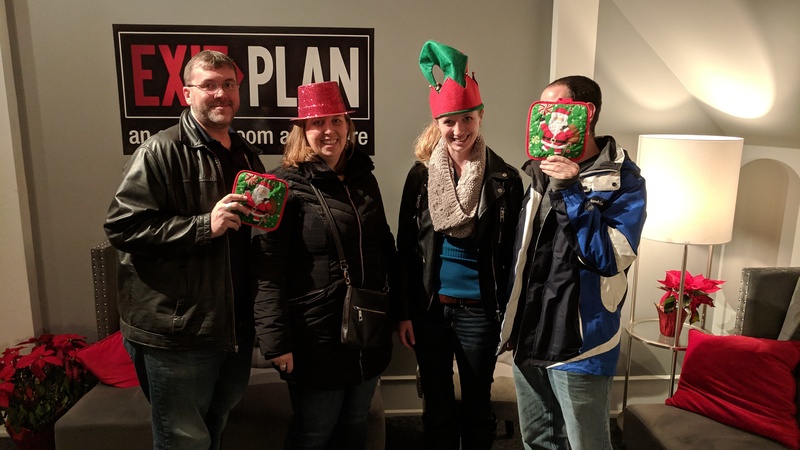 Posted in Leesburg, Virginia	Escape Room DiscountEscape Room ReviewEXIT PlanHolidayRating: NormalWe Failed! !